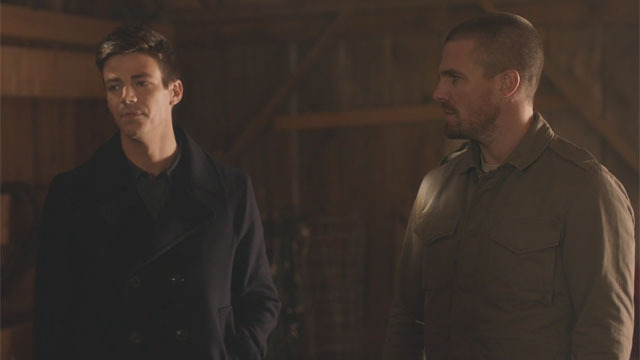 The CW has released a new clip from the upcoming Elseworlds crossover via Gamespot. Taken from Sunday’s episode of The Flash, the scene depicts Oliver Queen (Stephen Amell) and Barry Allen (Grant Gustin) getting introduced to Clark Kent (Tyler Hoechlin) and Lois Lane (Elizabeth McCulloch). You can check out the new clip below. The scene takes place on Smallville’s Kent Farm in Kara / Supergirl’s (Melissa Benoist) universe. Following a brief misunderstanding between Lois, Barry, and Oliver, Kara and Clark dash into the barn to clear things up. We know the event starts with Oliver and Barry switching lives. Kara is one of the few people who can tell who’s really who. This leads us to believe that whatever caused them to trade lives had no effect on Kara’s Earth-38…for now, that is. Once Oliver demonstrates his newfound speed, the group sets out to learn what caused this shift in reality. RELATED: Extended Trailer for the Elseworlds Crossover is Here! In a bit of comic relief, Oliver is also seen puffing his chest out when he realizes that Clark is Superman. Lucky for him, he won’t be the only one reacting to an iconic superhero during the event. A recent interview with Gustin revealed that Barry is a big fan of Batman. Of course, he’s disappointed to learn that the caped crusader has been missing for several years. Oliver, on the other hand, doesn’t even believe that the Dark Knight actually exists. We can only imagine how he’ll react when the heroes inevitably cross paths with Ruby Rose’s Batwoman. She will make her first appearance in Part 2 of the crossover, which airs Monday night as an episode of Arrow. What did you think of this new clip from Elseworlds? Share your thoughts in the comment section below!